So here is my tip. Go get yourself checked out. If you claim that marvellous Celtic heritage do it even sooner. If you think there is a mysterious reason people in the country wear big hats, it is because they like the idea of keeping their nose and ears. Heavy shirts nowadays come in many colours, wear one. Sunglasses don’t have to be designer, they just have to stop you getting a marble for an eye. Stories like this are more than an everyday occurrence in Queensland. 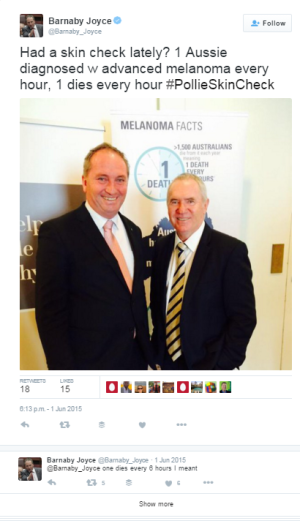 Most people living in Queensland do not take sun protection seriously enough, regardless of your views on politics Barnaby’s point is well made. Even more importantly don’t stop nagging your family and kids to protect their skin.